Every year J.D. 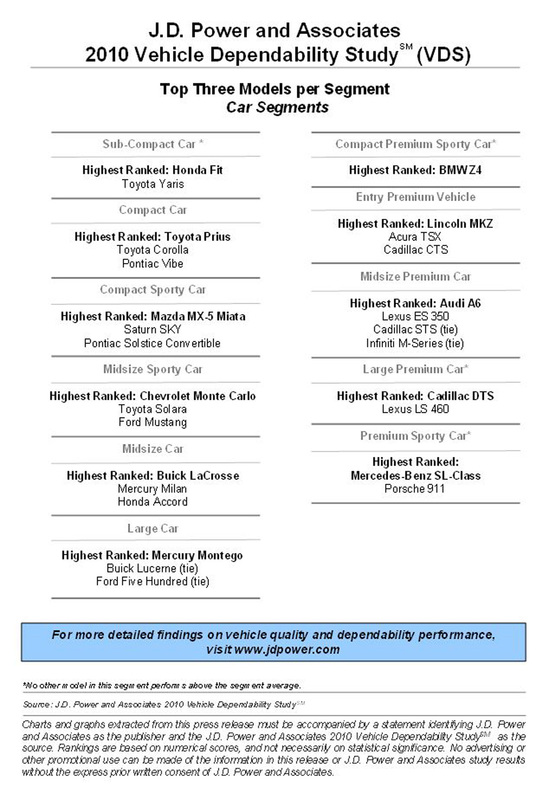 Power and Associates releases a new Vehicle Dependability Study (VDS) and ranks vehicle makes by number of problems experienced by orginal owners of 3 year old vehicles (model year 2007). This year’s study has a few changes from last year putting Porsche, Buick and Lincoln back in the top rankings among the usual Lexus’s, Toyota’s and Honda’s. Where does your vehicle rank? Are you pleased with the ranking that your car make received this year? Official J.D. Power and Associates 2010 Vehicle Dependability Study (VDS)link here. 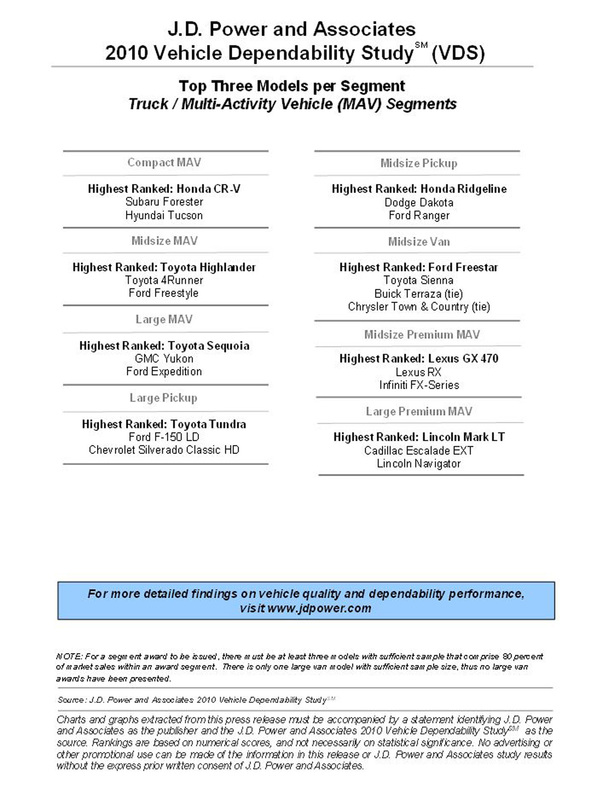 WESTLAKE VILLAGE, Calif.: 18 March 2010 – Twenty-five of 36 vehicle brands have improved in long-term dependability in 2010 compared with their performance in 2009, continuing a steady trend of industry-wide improvement. However, for some of these brands, consumer perceptions have not kept pace with their actual performance, according to the J.D. Power and Associates 2010 U.S. Vehicle Dependability StudySM (VDS) released today. The study, which measures problems experienced by original owners of three-year-old (2007 model year) vehicles, includes 198 different problem symptoms across all areas of the vehicle. 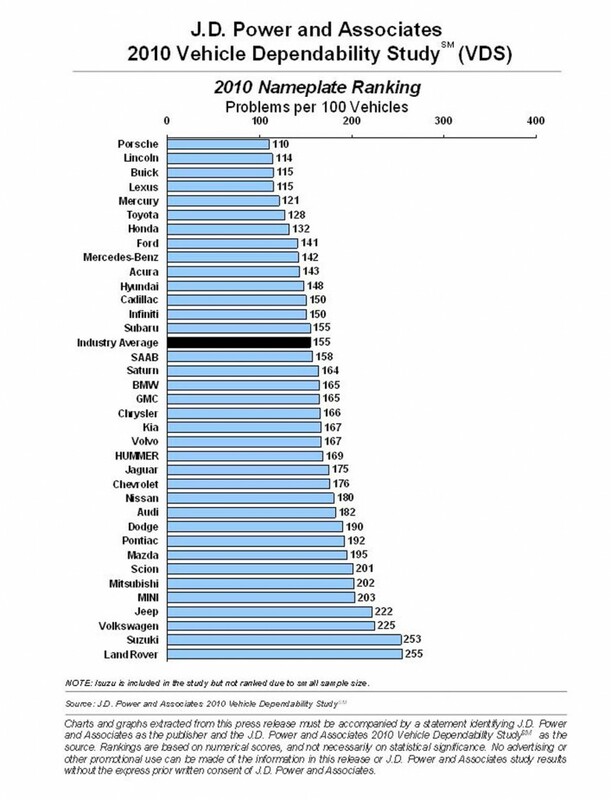 Overall dependability is determined by the level of problems experienced per 100 vehicles (PP100), with a lower score reflecting higher quality. The Vehicle Dependability Study is used extensively by vehicle manufacturers worldwide to help design and build better vehicles-which typically translates to higher resale values-and by consumers to help them make more-informed choices for both new- and used- vehicle purchases. According to J.D. Power and Associates, among new-vehicle shoppers, perception of quality and dependability is the most influential factor in their decision to purchase a specific vehicle model. The study finds that several brands that perform well in long-term dependability in 2010 are avoided at relatively high rates due to consumer concerns about dependability. Among brands included in VDS, Cadillac, Ford, Hyundai, Lincoln and Mercury have the greatest lags between dependability performance and consumer perception. According to Sargent, approaches that can help reinforce perceptions of high quality in consumers’ minds include: providing extended warranties, which demonstrates a brand’s faith in its products; incorporating features, materials and finishes in vehicles that have a rich feel; and ensuring that new models launch with better quality than their predecessors. In addition, automakers need to increase communication efforts about their high quality and dependability through social media channels such as blogs, Facebook and Twitter as well as through traditional channels. Toyota continues to perform well in long-term dependability and garners four segment awards-more than any other nameplate in 2010-for the Highlander, Prius, Sequoia and Tundra. Honda receives three segment awards for the CR-V, Fit and Ridgeline. Lincoln captures two awards for the Mark LT and MKZ. Models by Audi, BMW, Buick, Cadillac, Chevrolet, Ford, Lexus, Mazda, Mercedes-Benz and Mercury each receive an award in their respective segments. Porsche leads the overall nameplate rankings in 2010, which is consistent with its performance in the J.D. Power and Associates 2007 Initial Quality Study,SM which measures new-vehicle quality at 90 days of ownership. Lincoln improves by six rank positions from 2009 to follow Porsche in the nameplate rankings. Rounding out the top five nameplates are Buick, Lexus and Mercury. In addition, seven of the 10 models with the lowest incidence of problems in the industry are from Ford and General Motors, including the 2007 model-year Buick Lacrosse, Buick Lucerne, Cadillac DTS, Ford Five Hundred, Lincoln MKZ, Mercury Milan, and Mercury Montego. Overall vehicle dependability has improved by 7 percent in 2010 to an average of 155 PP100, compared with 167 PP100 in 2009 -a rate that is consistent with historical industry gains. In addition to the improvement in overall dependability, the rate of component replacement has also been reduced from 2009. Approximately 65 percent of owners indicate they replaced a vehicle component in 2010, compared with 68 percent in 2009. The study also finds that long-term dependability has a significant positive effect on repurchase intent. Among owners who say they did not experience problems with their vehicle, 43 percent indicate they “definitely will” repurchase their current brand. This figure declines to 28 percent among owners who say they experienced at least one problem with their vehicle. The 2010 Vehicle Dependability Study is based on responses from more than 52,000 original owners of 2007 model-year vehicles. The study was fielded between October and December 2009. Founded in 1888, The McGraw-Hill Companies is a leading global information services company meeting worldwide needs in the financial services, education and business information markets through leading brands such as Standard & Poor’s, McGraw-Hill Education, Platts, Capital IQ, J.D. Power and Associates, McGraw-Hill Construction and Aviation Week. The Corporation has more than 280 offices in 40 countries. Sales in 2009 were $5.95 billion. Additional information is available at http://www.mcgraw-hill.com/.